Do you have a friend that you have known for years? If so, this birthday card would be perfect for their big day! It features a message that lets them know you feel they are the same fun and awesome person they were when you first met them. This special birthday card displays wonderful colors and perfectly wrapped birthday presents. Your friend is going to love this fantastic greeting card! Good friends are special and deserve to be told why you consider them such a great friend. This meaningful birthday card will touch your friend's heart knowing how they have been there for you to lend a helping hand and make you laugh when you need it the most. This birthday card will clearly make her feel wonderful. It showcases a beautiful scene filled with butterflies, flowers, and a special rainbow. Your friend is really going to enjoy this birthday card. This birthday card it popping with vibrant colors of pink and green and it certainly stands out from the crowd! It features a beautiful image of a slice of cake with three lovely candles on top. It's perfect! Send this awesome piece of cake over to your friend for her birthday before it's gone! Your friend will appreciate that you cared enough to send such a fantastic birthday card. This spectacular birthday card is beyond exciting and your friend will think you are the best for sending it their way! It's bursting with celebration elements such as vibrant fireworks and colorful birthday streamers. It truly doesn't get any better than this! 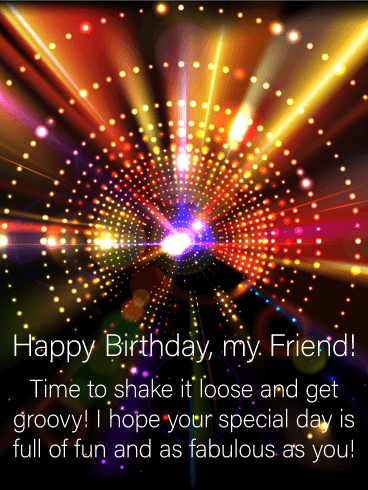 The message will mean a lot to your friend because it lets them know that you are wishing them a wonderful birthday. 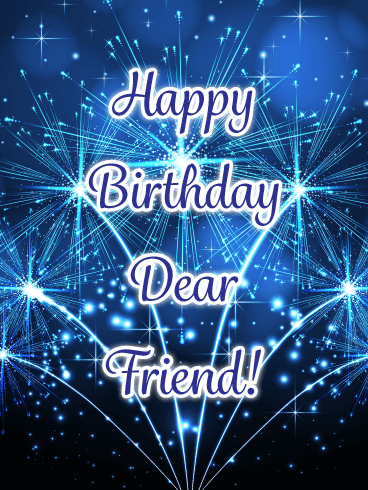 Make your friends day by sending this sparkling birthday card their way! Life is a treat, especially with your best friend! 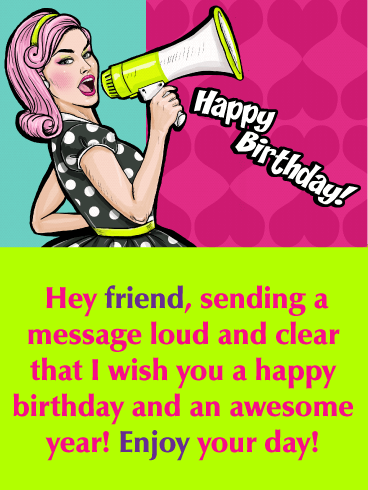 Send your friend this retro birthday card and wish her a great day! On her birthday, let your friend know there is no such thing as "too much of a good thing!" She can laugh, dance, and drink to her heart's content. 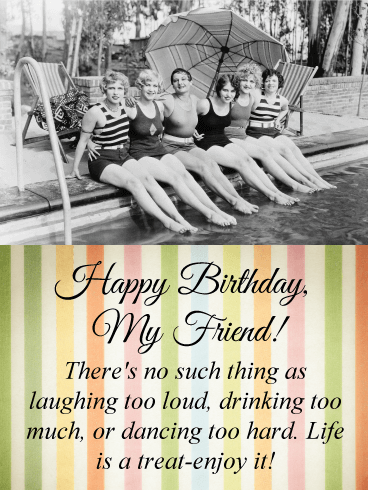 Your friend will love this vintage birthday greeting card because it's just so-gosh-darn fun! Send a birthday burst of fireworks to your friend today! Who doesn't love fireworks? This glittering display makes for a fantastic birthday greeting card that your friend is sure to love. Purple, pink and gold fireworks pop in the sky wishing your friend an amazing birthday. This stunning birthday card is easy to send and worth all the smiles it's sure to bring. This totally paw-some card will keep the good times rolling along for a fun friend's birthday! 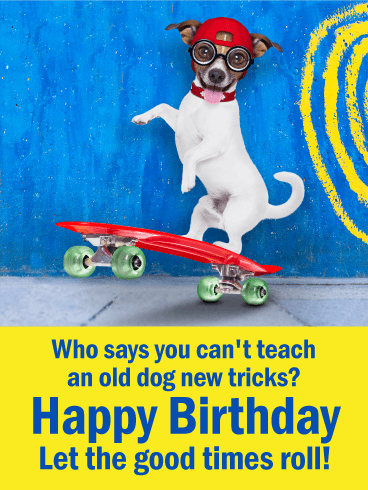 A skateboarding doggie reminds them that you can teach an old dog new tricks, bringing plenty of color and playfulness to their celebration, while convincing them that it's not so "ruff" turning another year older. A bright white cake decorated with frosting and topped with colorful "Happy Birthday" candles will have a wonderful friend in your life ready to party! 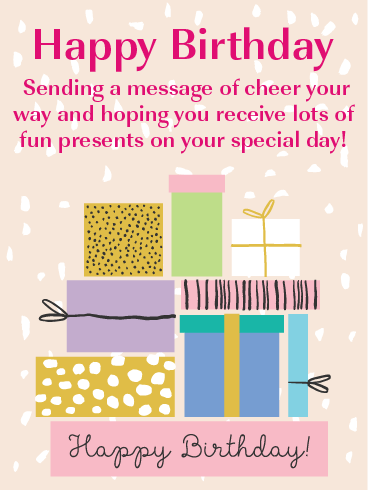 This birthday card is both fun & festive while also holding a special message for someone who means so much to you: a wish for an unforgettable celebration from start to finish. After all, there's no one who deserves it more! This vibrant birthday greeting card is a popular choice. A birthday card that shimmers and shines makes for a great statement on your friend's birthday. These dazzling birthday balloons explode across the greeting card in a stunning display of "oo la la!" and "huzzah!" 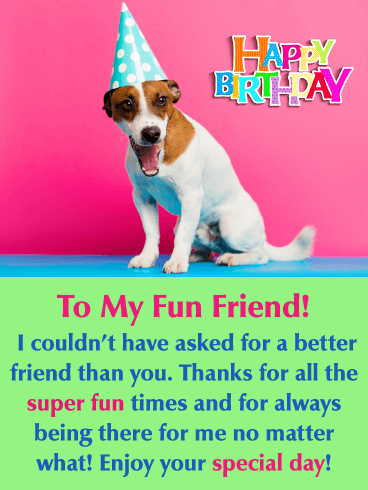 Wish your friend a birthday full of joy and happiness with this gorgeous and unique birthday card that really can't be beat. This birthday card sets the right tone for a special friend's birthday celebration! Brightly colored balloons and streamers decorate the top, and the message below reminds them that this day should be spent doing all the things that make them feel like the amazing person they are! A stack of gifts, all wrapped up and topped with fancy bows, will have a very special friend feeling like a star on their birthday! This charming birthday card comes with a wish for a "day full of presents, laughter and lots of fun! ", which is the perfect way for someone as wonderful as she is to celebrate such an important day. A birthday only happens once a year! Remind that special birthday friend the upcoming year is going to be better than the last, starting with their birthday! Don't let them forget how special they are and send them this birthday card today! Send this Valentine's card to friends who bring happiness and joy to you. It is important to send Valentine's Day wishes to your sweetheart, but it's also important to send cards to your close friends! If you are looking for nice and lovely Valentine's Day cards for your friends, choose this card! 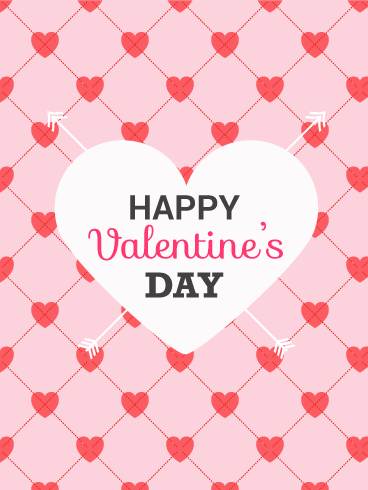 Let's wish everyone a happy Valentine's Day! Saying thanks is so much sweeter when you send this heartfelt, and heart-filled, card. A colorful background of hearts surrounds one cut-out white heart in the center. And below, your kind words help to express how loved you felt and how grateful you are to have someone so special as a friend. It's your friends birthday so you must be looking for a birthday card that has that extra something, well, you just found it! This greeting card features wonderfully designed lettering, perfect birthday gift boxes, celebration stars, and fun colors! It seems to have it all and your friend is going to be so happy you sent it their way! This birthday card lets your friend know that you wish they are surrounded by good friends and family on their big day! Your friend is going to love this birthday card, who wouldn't when it showcases such an adorable birthday puppy! The colors are an attention grabber - vibrant green, pink, and blue. Additionally, the creative Happy Birthday lettering makes this birthday card even more awesome! All these elements make this greeting card worth sending to your friend on their birthday! The best part is that the message will let them know that you could not have asked for a better friend! 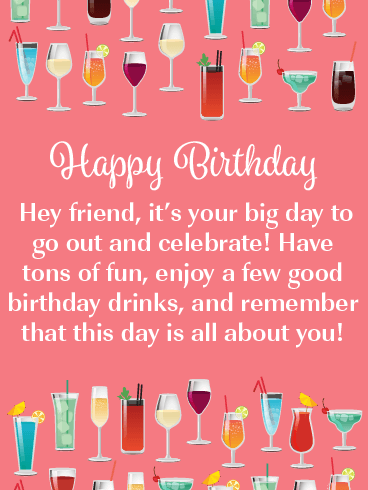 It's time to get this party started and send some birthday drinks to your friend for their big day! This birthday card is a reminder that birthdays are for celebrating and having tons of fun! It features unique Happy Birthday lettering, a background that displays a wonderful shade of pink, along with various colored drinks that look fantastic! 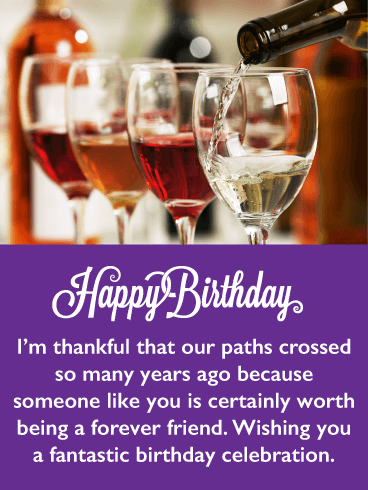 Be sure to send this birthday card to your friend right away so they can enjoy these drinks on their special day! Presents are what can make a birthday so fun and this birthday card is filled with them! It showcases colorful decorative birthday gifts that your friend is going to love! 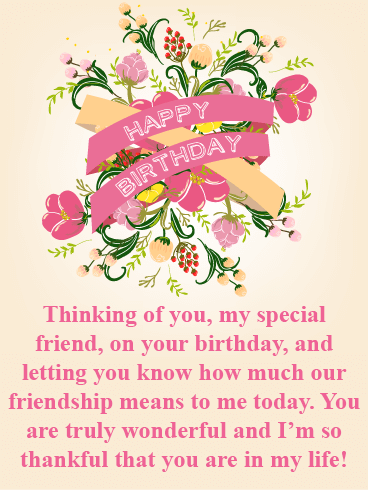 This birthday card will show your friend that you are thinking of them on their big day and that you are thoughtful enough to send some birthday cheer their way! Make his or her birthday a big hit this year by sending this sensational greeting card in honor of their birthday! 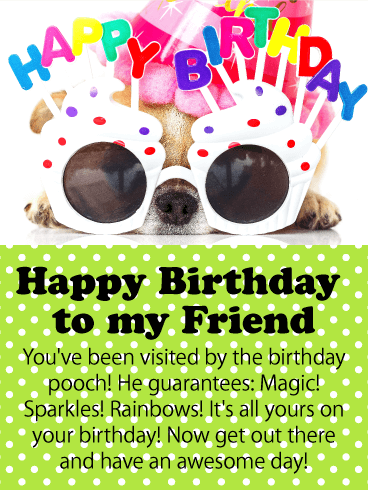 Send a bright and colorful birthday card to your awesome friend this year, they will appreciate it! This birthday card features the classic birthday icons – a decorative cake and candles! It thanks your friend for all the good times you have had together and lets them know you wish that all their birthday wishes come true! So send these candles over to your friend now so he or she can make a wish for their birthday! This traditional style birthday card will bring back memories of past celebrations and have your friend looking forward to this year's get-together. It showcases a perfect birthday cake, party balloons, streamers, and colorful birthday hats. Who could ask for more! Let your terrific friend know you are hoping they enjoy the day's festivities, and of course, the birthday cake! Make a statement with this vibrantly colored pop art birthday card! Your friend will love it so much they will want to frame it. It showcases a woman with fabulous pink hair and a stylish dress, she is clearly ready for the celebration at hand. 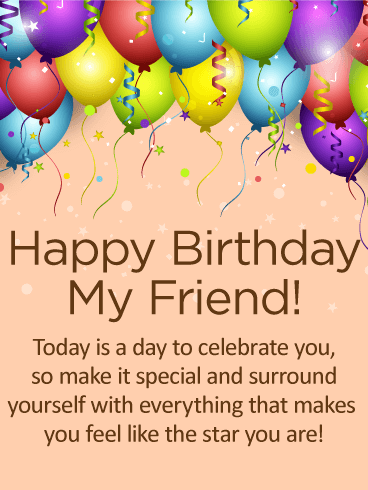 The message is clear, you want to wish your friend a happy birthday and an awesome year. Your friend will be touched that you sent such an awesome birthday card for their big day. This exciting birthday card would be perfect for your friend that is celebrating their grand occasion! Colorful balloons, a decorative gift box, and confetti stars fill the page of the spectacular birthday card. Your friend will be thrilled that you sent it their way. 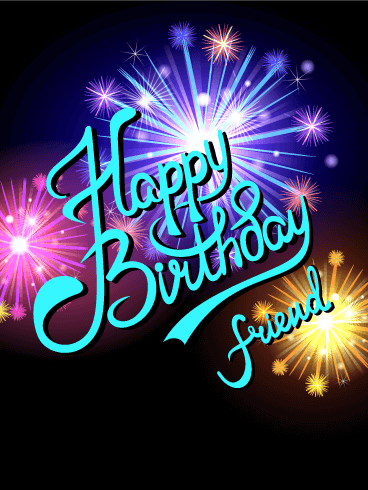 The words Happy Birthday Dear Friend will certainly add some joy to their special day! 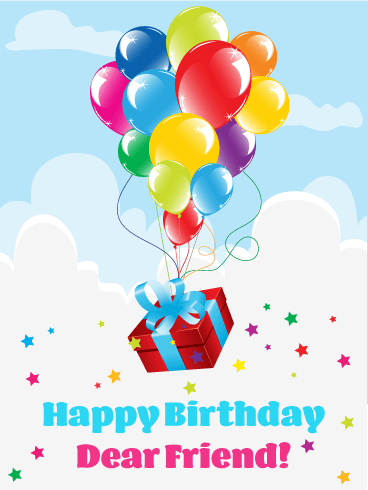 Send this creative birthday card to your friend today so they can enjoy these balloons and present right away! Let your dear friend know how much they mean to you with this exquisite birthday card. Eloquent flowers and decorative lettering come together to create a birthday card that your friend will just adore! The thoughtful message expresses that you are so thankful that your friend is in your life and that you feel they are truly wonderful. This charming birthday card will add joy to your friend's day as they are reminded of how much they mean to you. Pretty pastel colors were used to create this lovely birthday card that was designed just for your friend! It explains that you don't know what you would have done without them over all these years. It will make your friend feel good inside knowing they were needed. That's what friends are for! 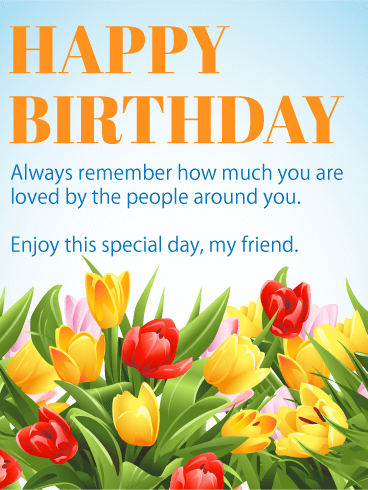 This birthday card will touch your friend's heart and add joy to their special day, so make sure to send it on its way! 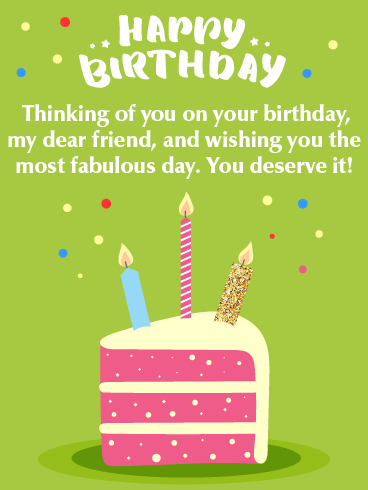 Wish your friend a happy birthday with some flair by sending this fabulous birthday card their way! Its sparkling lights and glittering sky will surely add some excitement to your friends day! The purple Happy Birthday lettering looks fantastic against the night's sky and will make your friend appreciate that you sent such a beautiful birthday card. Be sure to get these fireworks over to your friend soon to brighten their day! If you need a stylish birthday card to send to your friend, this one will work perfectly! It showcases two friends shopping and looking fabulous! It will certainly put a smile on your friend's face. 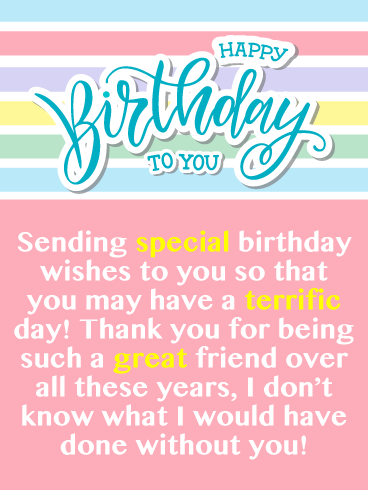 This birthday card expresses that you are glad to have a great friend like her, and that you wish her an exceptional day! Send this greeting card today if you want her birthday to get started in the best way! Is your friend a lover of fine wine? If so, then this birthday card was made just for them! It's a great reminder that their birthday is a day to celebrate and have a good time. 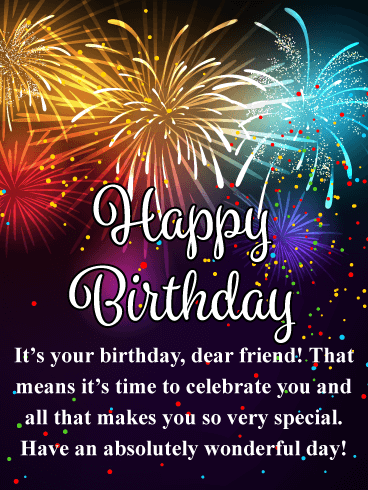 This greeting card expresses that you are thankful that the two of you have been friends for so long and that you wish them a fantastic birthday! Send these drinks soon so your friend can enjoy a glass of wine or two on their birthday! 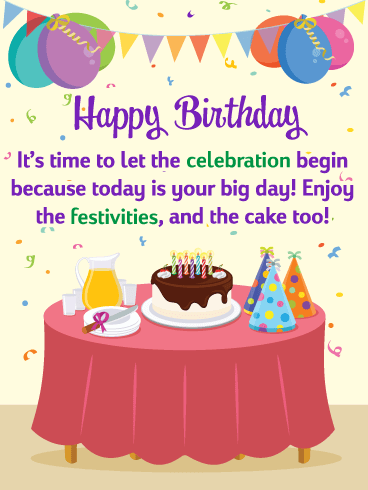 Send your friend this awesome birthday card that features a fun and colorful birthday cake! It will definitely get him or her excited about their birthday! This terrific greeting card also displays birthday balloons, party hats, and streamers! Everything your friend will need to get their birthday started the right way. 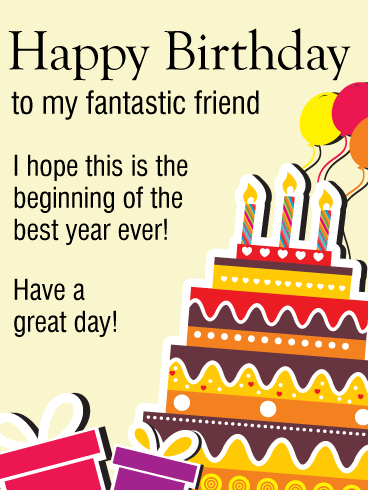 So send these birthday wishes over to your friend today by getting this fantastic birthday card to them right away! 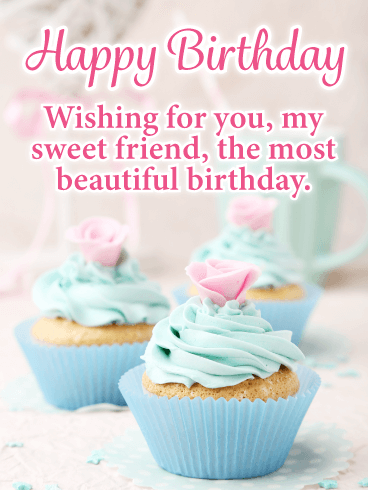 Make sure to give the very best to your friend by sending this charming cupcake birthday card for their special day. Pastel eloquent cupcakes and wonderful pink and white lettering make this birthday card so very special. 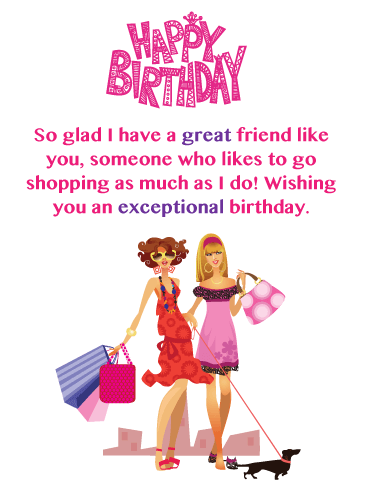 Your friend will love the fact that you are wishing her the most beautiful birthday. 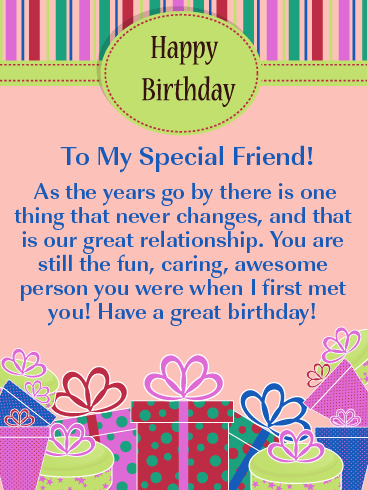 Sending this birthday card will make her realize just how special your friendship really is. 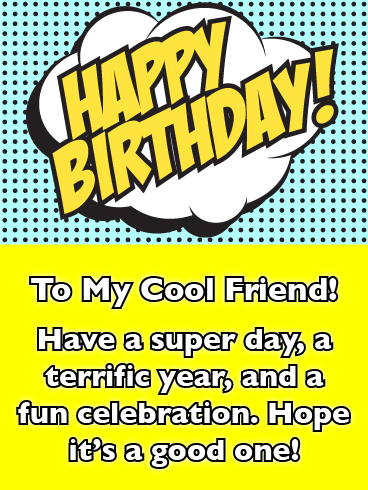 If you love comic style birthday cards with a pop art flair, then this is the one for you! 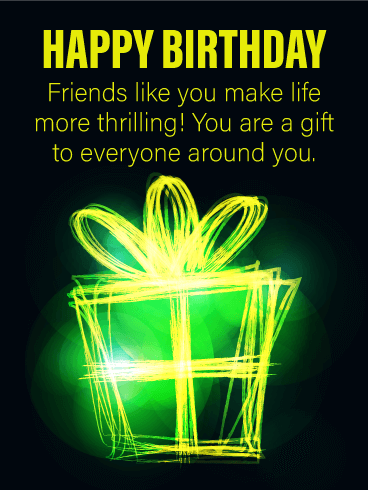 It will allow you to send your cool friend a birthday card they will always remember. The big block letters that spell out Happy Birthday look awesome against the special background, and the bright colors really pop! 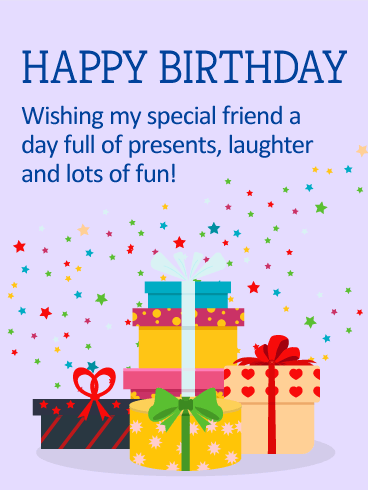 Wish your friend a super day and a terrific year by sending this fun birthday card today! Cheers to many more happy birthdays! 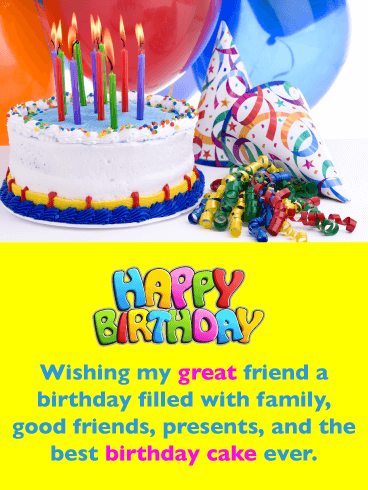 Wish your good friend a day of celebration and joy when you send this spirited birthday greeting card. Raise a glass to their health. No matter which language you toast in, they all get the point across-eat, drink, and be merry! 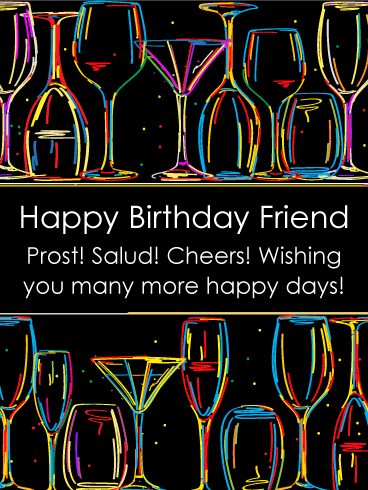 Send this modern and funky birthday ecard to a friend and make it a great birthday. 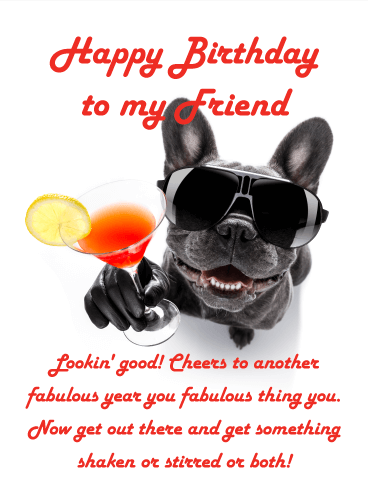 Birthdays should be fabulous-just like your best friend! Let's get the dance party started then! Light it up with lasers and disco balls, whatever you need to get loose and get groovy! For a friend who loves music or loves to dance, this spectacular birthday card is just perfect. 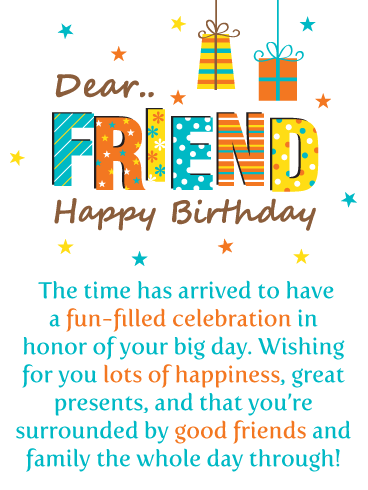 A birthday greeting card is a terrific way to celebrate your friend's special day. Good friends light up your life. 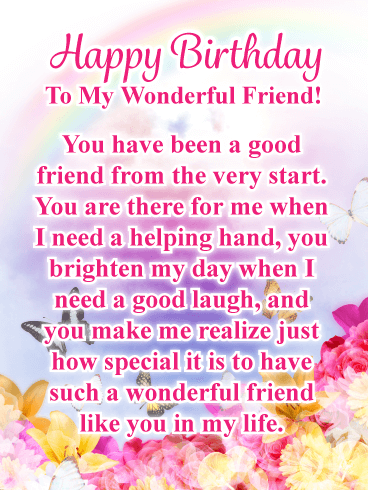 Wish your bestie a great day and send this festive birthday greeting card today. Remind them that life is just more thrilling when they are around. Let them know how special they are to you and everyone around them. This brilliant birthday card is a real visual treat with a message that's totally thoughtful and super sweet! Say it in lights! Your friend is the star of her birthday, heck she's the star of her life! 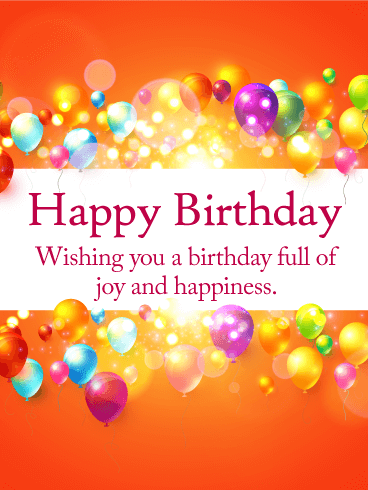 Send this amazing birthday greeting card to her today and let her know how exceptional she is. 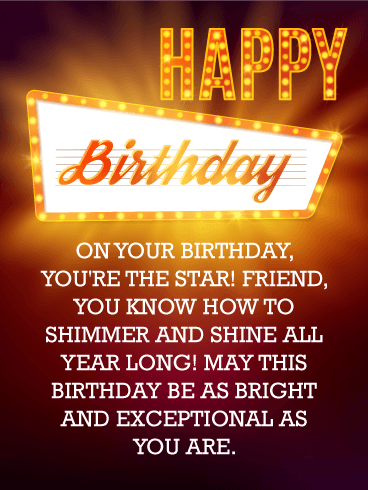 This dazzling birthday card is for a friend who really shines and lights ups the lives of everyone around her! It's super easy and fun to send. Too much of a good thing is...AWESOME. Yes, awesome. And on your friend's birthday, they deserve a lot of awesome. 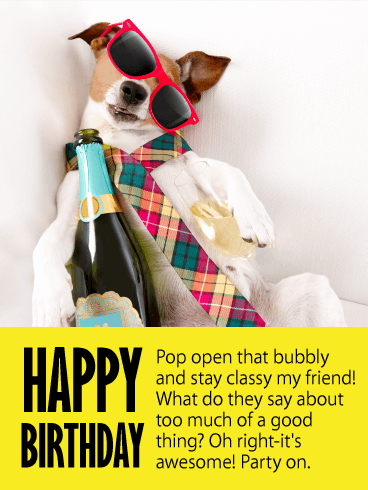 This humorous birthday ecard walks the fine line between classy and...well, you know. What are friends for if not to be there with you through it all? Stick together and send your friend this fun and silly birthday greeting card today. Shaken? Stirred? How about both? Birthdays are for excess, enjoyment, and indulgence. Send this stylish dog with his yummy martini to your favorite friend today. It's fun, it's funny, it's everything you want in a birthday card! 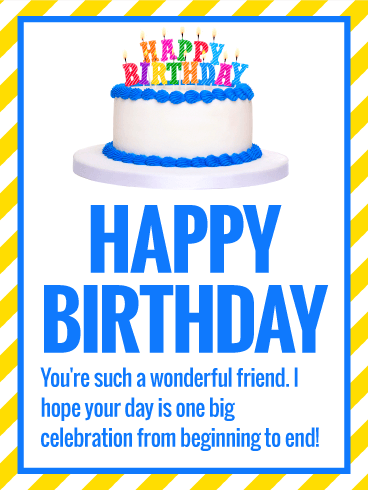 Get silly and send this fun-loving birthday greeting card to your very great pal today. They are sure to think it's beyond terrific. Woohoo, it's the birthday pooch! What's a birthday pooch? Just the cutest nugget of awesomeness ready to wish your friend the most magical and brilliant of birthdays! Rainbows? Check. Sparkles? You bet. Whatever your friend's heart desires, it's hers on her birthday guaranteed by the birthday pooch! Send this silly birthday card to your bestie today. It's kind of the best. She won't be disappointed. This awesomeness of this card comes from the fact that it is awesome in every way. 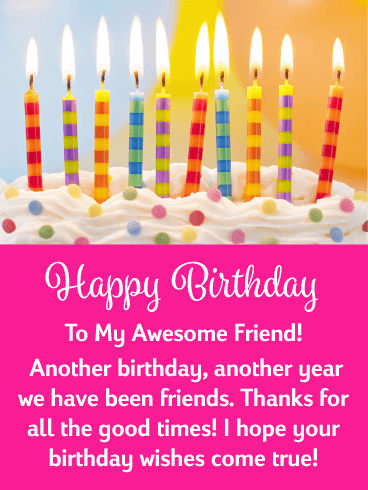 Send an awesome birthday card to an awesome friend and guarantee an awesome day! 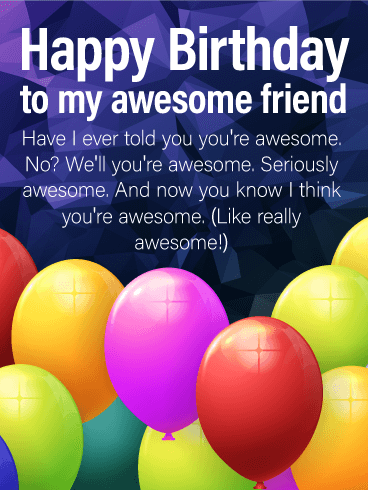 This humorous birthday greeting card is fun Everyone likes to hear that they're awesome and this card definitely gets the job done. Thoroughly. Awesomely. Right, you get the idea. Good friends are special to have and it's easy to be thankful for them. 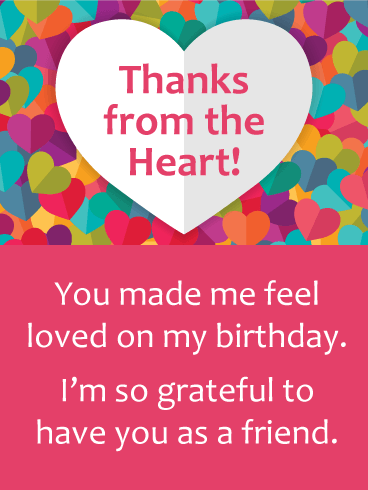 So give your friend the best birthday present ever by telling them how thankful you are for their friendship with this cheerful birthday card. It features bright and happy colors of yellow, pink, and blue, and was designed with an eye-catching pop art style! This birthday card contains a special message that will send a little joy their way on this very important day.